The Outlaw Album: Stories is a collection of 12 short stories from Daniel Woodrell, the award-wining author of the critically acclaimed, Winter’s Bone. Two of the stories, “The Black Step” and “The Night Stand” are modern day war-related, in a faraway country, while a third, “Woe to Live On” is nearer to home, giving a perspective on the Civil War. Readers thinking they may not be familiar with “Woe to Live On” will no doubt either have seen or heard about the movie it helped germinate: Ride With The Devil. In “The Black Step” a soldier returning from the war in Iraq, finds himself drawn into another war, this time at home, between family and neighbors. “The Night Stand,” arguably the most powerful weapon in the Outlaw armory, tells the poignant story about the nightmarish consequences of war when a veteran wakes up one night only to discover “a naked man standing over his bed, growling” at him and his wife. Another outstanding story in this fine collection is the gothic-esque “The Echo of Neighborly Bones,” opening with this hard-knuckle punch in the face: “Once Boshell finally killed his neighbor he couldn’t seem to quit killing him. He killed him again whenever he felt unloved or blue or simply had empty hours facing him. . . . Even dead, the man goaded a fella.” And all this because the neighbor killed Boshell’s dog. It’s a hell of a tale, in more ways that one. But its not all doom and gloom. Daniel Woodrell shows he has a wicket sense of humor hidden in his bloody veins. “Two Things” is a comical tale in which a social worker takes a keen interest in convict Cecil McCoy, a writer of flowery poetry. Is McCoy the reformed artist he claims to be, after his lengthy time spent in prison? Or is he up to his old manipulative tricks? If anyone should know, it’s McCoy’s parents, surely? The social worker eventually visits McCoy’s parents, hoping they will allow Cecil back in the home. But the parents are more than a little suspicious of their wayward son’s new ability to form words. What follows is a hilarious cut of cynicism Oscar Wilde would have been proud of. “Twin Forks,” “Florianne,” “One United,” “Dream Spot,” “The Horse in Our History,” “Uncle,” and “Returning the River,” complete this excellent collection. There have been many comparisons made about Mr. Woodrell’s storytelling mastery, linking him in the same golden chain to that of William Faulkner and Flannery O’Connor. And that is exactly what Daniel Woodrell is: a storyteller, first and foremost. 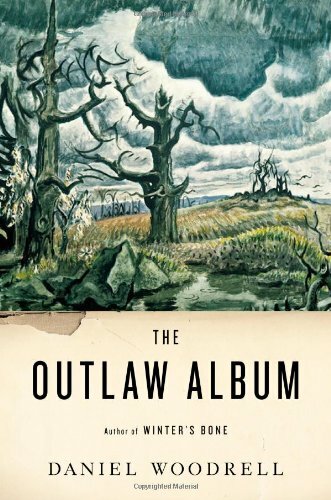 The stories in The Outlaw Album are riveting, enigmatic, lyrically blood-soaked with darkness, violence and revenge, but above all these things it is Mr. Woodrell’s sparse and disturbing to-the-bone prose that mesmerizes us to the very last drop of ink.